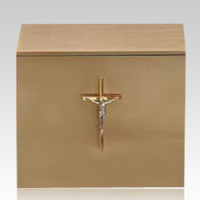 The Crucifix Bronze Cremation Urns are made form machine fabricated sheet bronze with a brushed bronze finish and a protective lacquer topcoat. "I got my headstone for the pet cemetery and the stone is great, my whole family loved the grave marker. I think my horse has a great memorial and will be remembered forever now. Thank you."